The complex is a community for people 55 years or older, near the Atlantic Ocean. 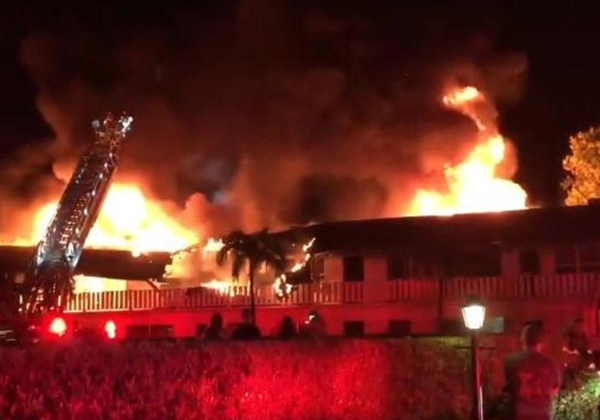 Authorities told CBS West Palm Beach affiliate WPEC-TV the fire broke out in an upper level unit and spread rapidly. Firefighters went door-to-door to make sure everyone got out safely. Deputies said at least 20 apartments were destroyed, WPEC says. The power was temporarily cut to the entire complex during the fire, causing issues for residents who rely on oxygen support, the station adds. Eight people were displaced and two of those eight were taken to the hospital with smoke inhalation, but their injuries were not serious, WPEC reports. The person who lives in the apartment that caught fire told authorities it was caused by a lit cigarette. However, authorities have yet to confirm his story and the fire's cause is still under investigation, WPEC says. After the Northridge Earthquake all builders had to embrace new sheer walls like Simpson Strong Tie, Hardy Panels and Threaded Rod systems like Earth Bound and now its time for all builder to raise the bar when it comes to all wood framed buildings and fire. We owe it to our brave Fire Fighters to embrace new Best Practice in Fire Elimination for all types of wood framed buildings our Fire Fighters families need them to get home safe. Just like you will want them to be there in rescue we need to be there now for them and make all new structures built with lumber safer with 100% fire protection inside buildings even if they are 2 story condo or townhouse projects. We are now calling all thousands of architects and specifiers to raise the bar in specifying fire protection on our GreenCE course. Protecting People and Buildings from Fire makes US Builder Better.